After 45 Years, US Support for Death Penalty Drops below 50%—What Now? In the midst of a significant bipartisan push for criminal justice reform, public support for the death penalty has slipped below the 50 percent mark, according to a Pew Research Center poll. In fact, this downward trajectory shows a move from a high of 80 percent support in 1995 to 49 percent now. 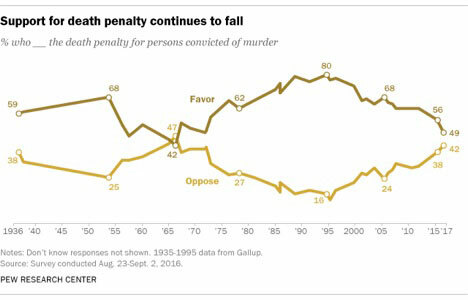 Opposition to the death penalty has also moved fairly significantly, from 16 percent in 1995 to 42 percent now. But the chart below illustrates why there will be no time to rest on any laurels. The last time support for the death penalty was below 50 percent was in 1971. Democrats and Republicans differ enormously on this issue: Only 34 percent of Democrats support the death penalty today, while within the Republicans’ ranks, support stands at 72 percent. Men support it more than women, and whites are more supportive than African Americans. One has to wonder what might move that 72 percent in a sustainable way?